Will Green Credit Cards Grow? Is green the new gold in credit cards? That was the prediction in 2007 after GE Money planted the first seed with its new Earth Rewards MasterCard program, which promised to divert as much as 1 percent of customers' purchases to projects for reducing emissions. As other credit card companies followed, a veritable forest of green credit card rewards programs looked bound to flourish. Can you use your credit card to shrink your carbon footprint? But GE Money quietly shut down the Earth Rewards program in July 2009. Energy & Environment Publishing reported that a GE spokesperson said there was not enough consumer interest in the program. At about the same time, MetaBank stopped accepting applications online for its much-touted Greenpay MasterCard, which also promised carbon dioxide offsets with customer purchases. The application page now states, "Due to initial program response, we've elected to make some system enhancements that require us to briefly suspend accepting new applications." So does this mean green credit card rewards programs will wither and die? Not necessarily. The Brighter Planet Visa Credit, provided by Bank of America, is still alive. The card lets you earn one "EarthSmart" point for every dollar you spend. Every point pays for approximately one pound of carbon offsets. The Brighter Planet Web site, meanwhile, lets you calculate your carbon footprint, link your card and track your daily progress toward reducing your footprint. Although carbon offset credit cards are few and far between, other credit cards let you earn points toward donations to your favorite environmental causes, such as the World Wildlife Fund or Sierra Club. • Go paperless. Sign up to get your credit card statements online and request your issuer to stop sending you paper statements. 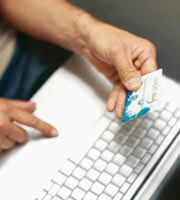 • Get a cash-back credit card and divert the rewards to your favorite environmental charity. Or use the cash to pay for green improvements at home, such as switching to energy-saving light bulbs and appliances. • Join an environmental group and get an affiliate credit card. • Use your credit card to make donations to reputable environmental groups. Whether it's green or platinum, you can put your credit card to good use. 0 Responses to "Going green with credit cards"